A quest to rediscover America's other border—the fascinating but little-known northern one. America's northern border is the world's longest international boundary, yet it remains obscure even to Americans. The northern border was America's primary border for centuries—much of the early history of the United States took place there—and to the tens of millions who live and work near the line, the region even has its own name: the northland. 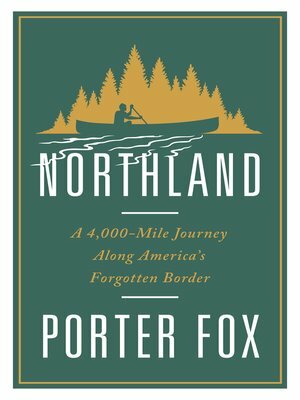 Travel writer Porter Fox spent three years exploring 4,000 miles of the border between Maine and Washington, traveling by canoe, freighter, car, and foot. In Northland, he blends a deeply reported and beautifully written story of the region's history with a riveting account of his travels. Setting out from the easternmost point in the mainland United States, Fox follows explorer Samuel de Champlain's adventures across the Northeast; recounts the rise and fall of the timber, iron, and rail industries; crosses the Great Lakes on a freighter; tracks America's fur traders through the Boundary Waters; and traces the forty-ninth parallel from Minnesota to the Pacific Ocean. Fox, who grew up the son of a boat-builder in Maine's northland, packs his narrative with colorful characters (Captain Meriwether Lewis, railroad tycoon James J. Hill, Chief Red Cloud of the Lakota Sioux) and extraordinary landscapes (Glacier National Park, the Northwest Angle, Washington's North Cascades). He weaves in his encounters with residents, border guards, Indian activists, and militia leaders to give a dynamic portrait of the northland today, wracked by climate change, water wars, oil booms, and border security. Porter Fox is the editor of Nowhere and the author of Deep. His writing has appeared in the New York Times, The Believer, Outside, National Geographic Adventure, and The Best American Travel Writing. Raised in Maine, he lives in New York.